Kingston and Associates have been registered Professional Land Surveyors since 1995 and are a member of the South African Geomatics Institute (SAGI). We specialise in servicing the needs of local Architects, Engineers, Town Planners and other Professionals, as well as members of the public in Noordhoek, Sun Valley, Fish Hoek, Glencairn, Clovelly, Simon’s Town, Masiphumelele, Ocean View, Kommetjie and Scarborough since 1998. A cadastral survey involves the demarcation of parcels of land and usually the preparation of a survey diagram for registration in a land registry. In South Africa, the Surveyor-General’s office holds the register of properties specifically related to their mapping extent and description. Cadastral Surveys are usually carried out by or under the control of a Professional Land Surveyor. Registered properties are defined by survey diagrams usually prepared by a registered Professional Land Surveyor. 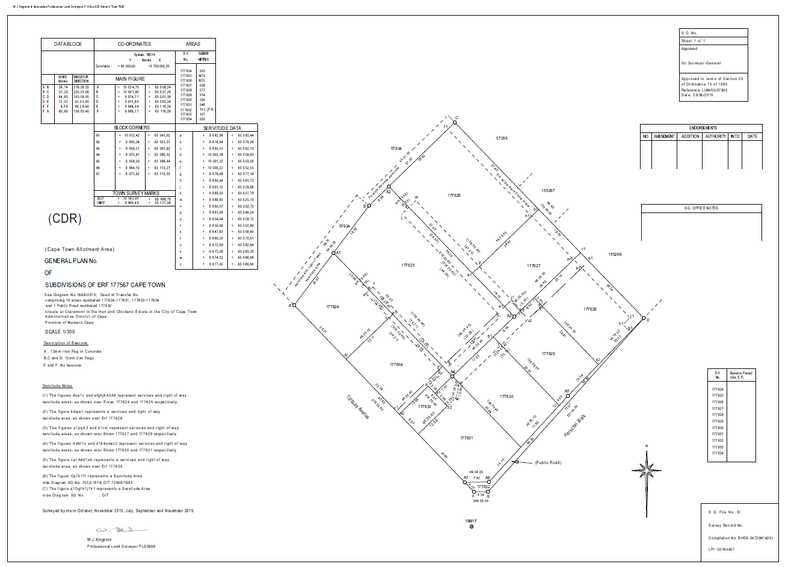 The survey diagrams are mainly characterised by unique coordinate values, beacon descriptions and descriptions of the property. As a result Registered Land Surveyors are tasked with the process of mapping and physically defining the extent of land parcels and preparing survey diagrams to be held by the Surveyor-general’s office. When individual land owners require changes in the process of land ownership, either for consolidation or subdivision of land parcels, registered Professional Land Surveyors are required to participate in the process and are uniquely placed to offer professional advice on the process. Whether it’s a new building being constructed or an existing property needing to re-define the extent of the land, Professional Land Surveyors offer essential services to define the extent of the land. preparation and submission of survey diagrams as well as preparing sectional title plans.